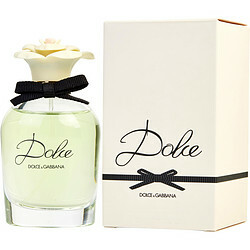 I bought the sample of Dolce by Dolce & Gabbana and I fell in love! Will be buying a bottle soon. Dolce is the modern version of Diors' Diorissimo, light refreshing, lilting fragrance. Wonderful if one wants to creat a new signature scent as this parfum is easy to wear night or day, not too strong for the office. So happy I found Dolce, and have added it to my favorites list. Absolute beautiful bottle, it will look gorgeous on your dresser. I just ordered Dolce on Monday. This will be my second bottle. I absolutely love it. The fragrance is so light. I went for years not wearing perfume because everything I tried smelled horrible on me. And I'm talking about some expensive perfumes. Now I have found something that smells wonderful on me!!! The fragrance is soft and subtle. I received the biggest compliment from my girlfriend as I walked past in her in church. You know if any woman gives you a compliment its good.